DreamGear puts out a lot of interesting video game accessories, and I got a chance to try out the Action Pack Plus for the Wii. These Wiimote accessories have a rubberized surface for better grip, and work well with the Motion Plus. I liked some of the controls like the racing wheel, which I used for the Cars 2 game. I also enjoyed the classic mod controller for games such as Super Mario Wii. The gun mount that you see in the picture made me wish I had more First Person Shooter (FPS) games as it had dual triggers (one for the B trigger button and another for the A button). The only thing that I could get to work right was the archery casing. I tried it out on a Wii Sports Resort, and I just couldn’t get a good shot in. 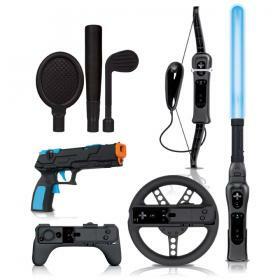 The Action Pack kit also had a housing for the Wiimote that attaches to a racket, baseball bat, golf club, as well as a lightsaber that uses two AAA batteries to glow. All in all, the Action Pack Plus for the Wii makes the Wii even more fun for the entire family. You should be able to get it for about $59.99 on the official DreamGear site, but just make certain that you have a Wii Remote Jacket.